Heading to the HTC Vive booth at MWC 2018 was a headset-wearing eye opener for anyone that’s followed the company and its journey into virtual reality. There were scores of developers showing their wares, each focused on delivering an entirely different VR experience that caters for their audience. Walking through it all was a bit like when James Bond enters Q’s lab. The one thread running through was the use of the HTC Vive and, in particular, its the Vive Tracker, which can turn almost anything into a VR controller. “We launched the tracker at last year’s MWC and had one or two examples of what it can do. But this year we brought many more examples,” says Graham Wheeler, Snr Director of VR at HTC. The key to this limitless imagination is that a tracker can be put on pretty much anything. We saw them strapped to arcade-style guns for a demo of zombie shooter Arizona Sunshine, on table tennis bats for some virtual sports fun and, our favorite, shin pads and football boots for the fantastic Mi Hiepa Sports, who have developed a coaching tool that helps footballers train while in rehabilitation. The demo we tried used the second generation Vive trackers, and it was a fantastic experience. The responsiveness of the trackers was very impressive, with the feeling when you actually hit a ball appearing more real than virtual. The demo we tried was a simple passing exercise to hit the balls that came at us into the corresponding goals. The sensors meant that you could add quite a bit of complexity to your moves, including steadying the ball, stopping it with your feet then kicking it into the net. “Don’t forget to look at your feet when you’re playing,” instructed Dickinson before we even kicked a ball. Looking at our feet, we checked our studs to make sure all was okay - and the level of detail was stunning. It’s not just us saying that, the Manchester-based studio has the likes of Paul Scholes interested in the technology, and it’s currently installed in Manchester United’s training academy. Swapping boots for balloons, the Grand Canyon hot air balloon VR experience showed off the HTC Vive Pro with the wireless add-on, one of the first times the technology has been available to try out. According to our colleague Jamie Carter, the untethered experience gets the thumbs up, noting: “If only all VR was like this”. The demo was made by Janimation VR, who have been using the wireless Vive Pro for a while and reckon you can get 2.5-3 hours of almost constant use out of it. Carter also went on a fascinating experience to cure his vertigo, thanks to TeleSoftas' Inner Child VR demo - something that was showcased away from the Vive stand but uses the VR technology. "We have a child, adult and parent position, and we identify with the child," explains Audrone Miskinyte, a professor who is to start using this experience in her studies. "It's natural, spontaneous, curious, and fun-seeking, and this kind of child can help us overcome our biggest fears – the child can set an example, can encourage, and can distract, and help us overcome our fear." Our untethered experience came in the form of the HTC Vive Focus - the headset that's currently only available in China at the moment. 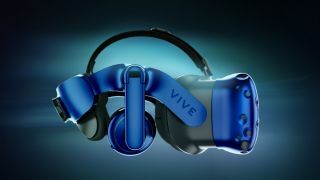 Regardless of its unavailability in the western market, Wheeler believes it shows off the best of what Vive has to offer. “People know that they will get the highest possible experience on each of the elements, when they use a Vive,” says Wheeler. After rolling around dodging shots and cowering behind some crates, we can attest to this. The HTC Vive Focus is a powerful device. It uses the same lenses (1,600 x 1,440 OLED display) as the HTC Vive Pro and is powered by a Snapdragon 835 processor. It’s mobile but doesn’t use a phone, which is a key differentiator when looking at it compared to something like the Samsung Gear VR. Launching first in China is a strategic move, explains Wheeler. “The Vive Focus is in a very different market. In China they don’t have Google or Facebook, so that market has different requirements. What we are trying to do is take the lead role in that environment,” he notes. “The Wave SDK, which is the open source SDK that the Focus is built on, isn’t just in HTC but in multiple manufacturers. So they can come and use our Vive Port and have different products and tiers and this allows us to get different developers on board which means we end up having great content. While HTC is keeping a close eye on China and the Vive Focus, everyone else is keeping a close eye on HTC. With mounting losses and persistent rumors of its Vive division being spun off, it is showcases like the one at MWC 2018 that may make the difference between success and failure for the headset. Wheeler is upbeat about what the future holds and he puts it all down to the tech innovations HTC is at the forefront at the moment. “Looking to the future, if you take AR, VR, 5G and AI - we are an expert in all of those fields and have a heritage in smartphones, the VR segment. "Tie all of those together and you have convergence. We see it as the Vive reality, where all of those experiences comes together. “It’s testament to how difficult it is to create the Vive experience [that there aren’t only a few trying to compete in the VR space].